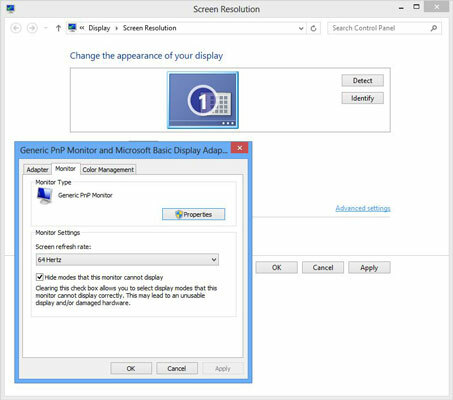 One of Windows’s many change-it-once-and-forget-about-it options, screen resolution determines how much information Windows 8 can cram onto your computer screen. Changing the resolution either shrinks everything to pack more stuff onscreen, or it enlarges everything at the expense of desktop real estate. 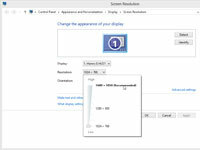 1Right-click a blank part of your desktop and choose Screen Resolution. The Screen Resolution window appears. 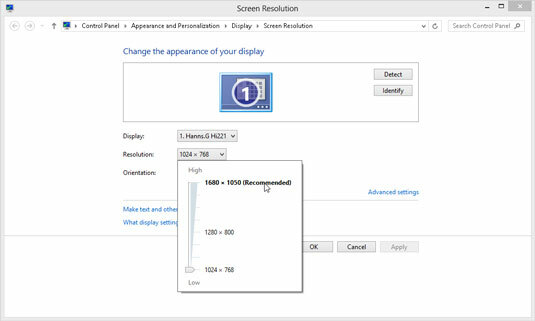 2To change the screen resolution, click the Resolution drop-down list and use your mouse to drag the little bar between High and Low. Watch the little preview screen near the window’s top change as you move the mouse. The more you slide the bar upward, the larger your computer screen grows. Unfortunately, the more information Windows 8 can pack onto your computer screen, the smaller that information appears. There’s no right or wrong choice here, but choosing Windows’ recommended setting makes for the clearest text and images. 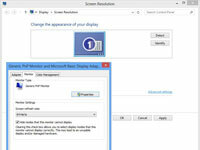 Windows 8 only lets you snap an app to the side of your desktop at resolutions of 1366 x 768 or higher. 3View your display changes by clicking the Apply button. Then click the Keep Changes button to authorize the change. When Windows 8 makes drastic change to your display, it gives you 15 seconds to approve the change by clicking a Keep Changes button. If a technical glitch renders your screen unreadable, you won’t be able to see or click the onscreen button. After a few seconds, Windows notices that you didn’t approve, and it reverts to your original, viewable display settings. 4Click OK when you’re done tweaking the display. After you change your video resolution once, you’ll probably never return here unless you buy a new, larger monitor. You’ll also want to revisit here if you plug a second computer screen into your PC.